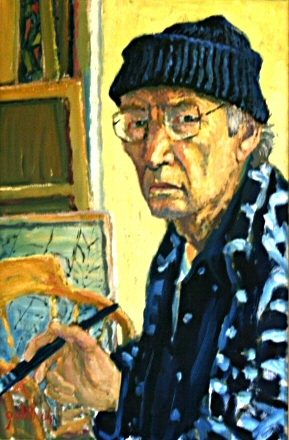 Moshe Galili was born in Hungary in 1930. He was a child survivor of the Holocaust kept alive by hiding and by the brave efforts of his mother who was determined that her four children should live. His father was wounded by gunshot while fighting the Nazis in Budapest, and died as a result. His experiences from that period have been adapted from his original story and published in 2001 under the title "The Star Houses" as part of a series for teenagers studying WW2. ISBN 0-7502-3311-7. In 1948 he went to Israel, arriving a month before The Declaration of Independence. After military service he studied at the Bezalel Art School in Jerusalem and was an early member of the artistic village at Ein Hod. He also studied Arts and Crafts in Italy, the Ecole des Beaux-Arts, in Paris and at St. John Cass City Literary Institute, in London. He has lived in London since 1962 and has worked on a number of stained glass commissions as well as paintings and art works in various mediums. He is married to Ruby, who taught history in a Haringey Comprehensive and is now involved in Local History Research. They have a grown up son. Moshe Galili has been profoundly affected by the events of his teenage years in Hungary. The story of these times is told in the Budapest Series on this website. All pictures and text in this website ©Moshe Galili 2008.